The Kimball Group is a focused team of senior consultants specializing in the design of effective data warehouses to deliver enhanced business intelligence. The site needed to be user friendly while presenting a lot of information. It is. 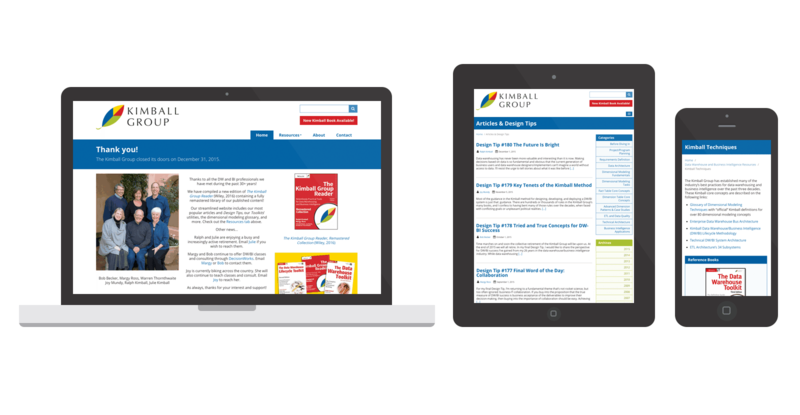 The Kimball Group website is an important tool in reaching out to existing and new clients, to provide updates on up and coming seminars and classes, as well as to advertise their books and other services. The website was built with WordPress, using our custom Responsive WordPress Framework, it’s a custom designed and developed website with several custom options. A few of the options include theme options, these help control website elements allowing the site admin an easy process in managing elements on the site. In addition to site options the site admin can easily add classes to the schedule, resource articles and tips plus much more. Spark Logix Studios established third party processes for the Kimball Group including Mailchimp and Facebook. Spark Logix Studios also manages several online marketing efforts for the company.